Turtles are adorable, and many people find that they’re the perfect pet. Having a turtle as a pet has its perks. But first, you have to setup their tank which is a bit daunting. No doubt you want the best turtle tank for your shelled friend. Establishing a quality home for your new turtle or transferring your beloved pet to a new home requires a bit of research. We’ve gathered everything we could to help you understand how to setup a turtle tank and reviewed the top 5 turtle tank kits available. Remember, no one’s stopping you from purchasing everything individually to setup your habitat. But, setting up your habitat is difficult and time-consuming. It’s difficult establishing your environment, but there are a few things to take into serious consideration. You want to set them up, so it’s easy to see them swimming. But you don’t want to overcrowd your top layer and make it difficult for them to get to a place where they can bask. Ease of connecting filters, heaters, and other components. Finding the right size is part science and part artistic guessing. Your shelled friend need space to swim, space to hide, space to bask and space to eat. If your turtle feels cramped, they’ll miss out on important exercise and experience constant stress from not having a safe space to hide. Your turtle should feel safe and comfortable at all times. It’s vital that you size your tank appropriately. Otherwise, you’ll need to buy another soon. It’s their house, their gym, a cafeteria and a bathroom. Most veterinarians recommend the following: 5 to 10 times the length of their shell in gallons. So, a turtle whose shell is 4 inches long, you need a 20 to 40-gallon tank. But, don’t forget to factor for the full size your turtle will probably reach. If an adult turtle reaches 10 inches, you need a tank that is 50-100 gallons. Whether you buy a tank for the anticipated adult size of your turtle or their current size is completely up to you. But, it’s always a good choice to round up and have a slightly bigger tank rather than a slightly smaller one. Finding any old aquarium is easy, but finding one that fits the needs for a turtle is difficult. So, we’ve looked at both specialty aquariums, as well as turtle kits. Many of the turtle kits are starter sets, but they’re worth the investment. This terrarium kit is designed for turtle use. The double doors opening in the front and out is a feature that is difficult to find. Then the waterproof base is peace of mind that you’re not going to risk water damage and your apartment’s security deposit. Finally, this tank is available in a wide variety of different dimension, so you can choose the model that fits your needs. This aquarium is versatile and easily adapts to your needs. It is easy to setup different filters and heat accessories without disruption. Initially, the double doors stand out as the premier feature. But, once you start digging into what this tank brings to the table, it’s raised bottom frame is the best aspect. This glass panel is raised which enables proper mounting of a heat cable but keeps the bottom section well-ventilated. Although this aquarium comes with everything you could need to start your turtle habitat, the price is a bit steep. Sure, you can easily pay upwards of $$$ when selecting your components for a regular glass tank, but all those pieces are exactly what you want. Here, you are getting the tank and decorative background which means you’re not done buying pieces for your tank. You still need a basking rock, heat lamps, and any decorative pieces you want. 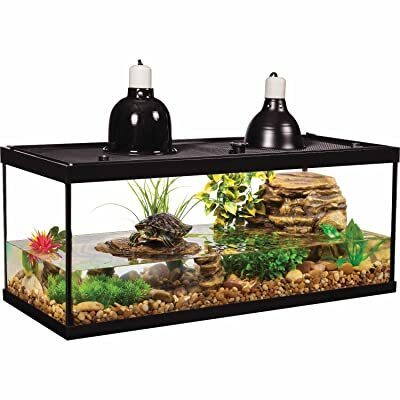 This aquarium is a great tank that has features many turtle owners would love to have. The ability to reach into your tank and scoop up your turtle rather than reaching in and pulling him out is a huge benefit. If a tank of this size and price is in your budget, it’s worth considering. Altogether there are 12 different sizes available. They all highlight the double front opening doors which lock and the raised glass panel. It also has a useful screen top allowing light and infrared to go through easily. This complete kit is nearly everything you could ask for to start your turtle habitat. LED lighting, a “whisper” power filter, aquarium hood, heater, and aquatic plant multipacks. The addition of an anemone is appreciated creating a natural hiding spot for your shelled friend. This tank is colorful which is visually appealing and fits easily in most household spaces. It’s crafted in the USA with starch resistant glass and comes with a lifetime warranty. The Tetra 20-gallon kit is a starting point for a new turtle owner. The terrarium itself is high-quality although not large enough for a turtle to reach full adult size. An additional bonus is that is has everything you need to get started. No doubt you’ll replace a number of these items as you determine what you like and dislike in your turtle tank. However, all the pieces you need is available. What’s the downfall of this aquarium kit? It is the quality, or lack thereof, of all the parts that come with the tank. In short, the filter, heater, hood and light system are cheap. The light system will still last for a while, but the filter and heater will need replacing shortly after purchase. A power filter isn’t reasonable for a turtle though. Most turtle owners find they are most comfortable with a canister filter. A slow but steady wins the race attempt at keeping your tank clean. Power filters can disrupt turtle tanks, and this one is mostly worthless because your water level is so low. This terrarium is a great option for beginners who don’t have many preferences set in stone yet. But, the idea of having to replace nearly everything that comes with the kit is both a pain and expensive. If you’re starting out, consider this kit as a learning opportunity. While you might want to add plant life, and rock or another substrate they’re not immediately necessary. The basking platform is the highlight, and it looks wonderful with the decorative repto-filter. The filter creates a waterfall area over their basking center. It’s the best of both worlds for your new turtle. You might have noticed that the highlighted points above aren’t features, but what is included in the kit. That’s the best part of buying this kit is that it does include everything you need and it’s high-quality. Unlike other turtle tanks we’ve evaluated, it isn’t a good tank combined with accessories that will break soon. The only downside to this tank is that there aren’t different size options. When you purchase this kit, you’re condemning yourself to need a new tank sometime in the future. Although a 20-gallon tank will work well for many juvenile turtles. Not to mention turtles aren’t necessarily fast-growing creatures so that a 20-gallon tank could last you for a while. However, the accessories that come with it will probably last longer than the tank. This is a quality tank and has a plethora of quality accessories. It is definitely worth the buy if you’re looking for a 20-gallon tank. The Tetra Deluxe Aquatic Turtle Kit is a complete kit, and it’s highly recommended if you’re new to turtle ownership. Zilla is a well-loved brand, and they take traditional tanks then put a new spin on them. Zilla caters their turtle kits by offering a rimless and open-topped option. The front of the terrarium is chamfered, and the tank is setup with premium heating and UVB lighting. The quality that Zilla brings to its twist on a standard aquarium is amazing. The chamfered front makes it easy to watch your turtle enjoy their time in the water or basking. The open-top also makes heating and lighting easy without cultivating excessive bacteria or cold spots. Again, we find that the only issue is the size of the tank. This aquarium is a 20-gallon turtle tank. So again, you are going to have to replace the tank eventually. For juvenile turtles, this is a great tank to start them out in. Juvenile turtles will greatly enjoy the open-top and chamfered front. 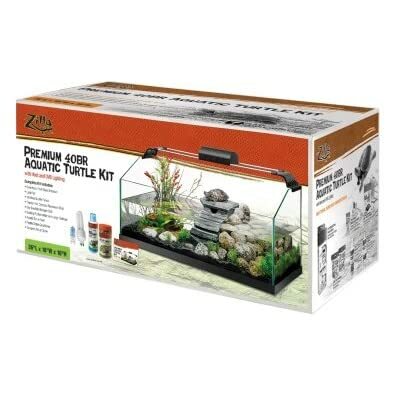 Zilla has additional turtle tank options in larger sizes with these same features however they aren’t complete kits. So, if you plan on keeping the same tank structure, it’s easy to order through Zilla. 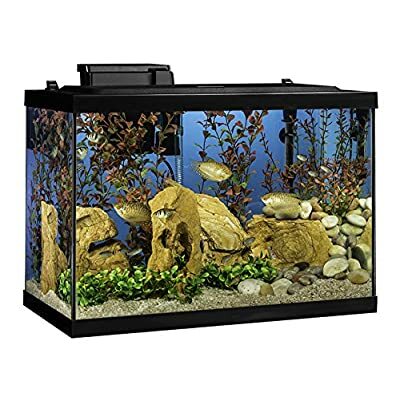 SeaClear offers a wonderful 50-gallon tank that comes with reflectors, and the light fixture. While you will need to purchase the appropriate heating unit, lights, basking area, ramp, and substrate the aquarium itself basically can’t be beaten. The fact that this aquarium is acrylic over glass makes all the difference. 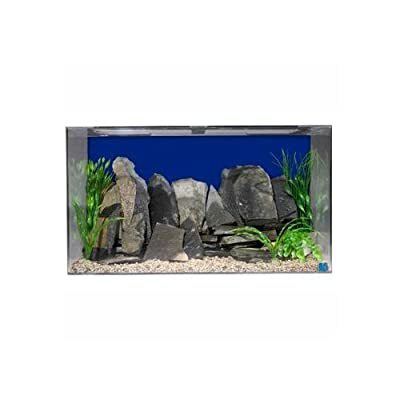 Acrylic aquariums are much lighter, making moving easier and they are resistant to impact. There is much less risk with an acrylic aquarium as they are less prone to cracking, shattering, or chipping. This is a great option if you have children around. For this price range, we were looking for a full kit. Something that comes with a background that makes heating and lighting hookups easy. This is all the size that a turtle owner could want for most juvenile and adult turtles. However, everything else is lacking. High-quality acrylic tanks are hard to come by, but they’re worth it. If it’s in your budget to pay this much for an aquarium and they still need to purchase the necessary accessories, we recommend this tank. Otherwise, it might be your best bet to buy a kit, and then work your way into an acrylic aquarium. Although it’s expensive, the winner is still the Exo Terra All Glass Terrarium. Although you still need to purchase a variety of other habitat components, this is the best turtle tank available when taking into consideration the aspects of the values section. The Exo Terra All Glass Terrarium comes in 12 different sizes, so you’re sure to find one that fits your turtle well and gives room to grow. Basking space is part of this; there are some wide varieties of the 12 size options. 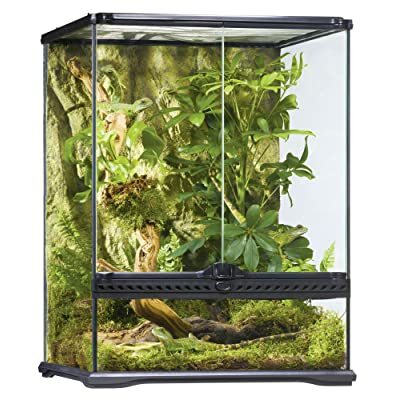 The Exo Terra background that comes with this kit has channels which run cords and tubbing from the bottom of the terrarium all the way to the top. Concealing cords is an issue with turtle aquariums because they enjoy chewing on anything they can get near. Always remember to consider the anticipated adult size when you’re purchasing your tank. It’s easier to purchase one, rather than one now and one in a few years. Besides that, having more space allows your turtle all the room he could want for swimming, lazing, and hiding. You can have the best turtle tank, and if it’s the wrong size, you won’t have the right product for your turtle.